Prepare an Avastar for posing. Avastar basically creates animatable Models (Avatars&attachments) and animations. Therefore the tool adds various functions and user interface elements to Blender. The full functionality of Avastar is a bit overwhelming on first sight. You better are ready to spend some time and patience to get it all working nicely for your projects. What does this Document offer? You learn how to create a simple (static) pose for your Avatar and export this pose for usage in Second Life. Every aspect of 3D modelling IS artwork. And nothing works just in a couple of minutes. If you are new to Posing and animating, then please get ready to learn a lot of tools and keep your patience. And be aware that you won’t get perfect results on the first try. 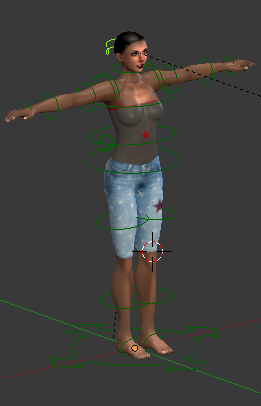 Whenever you create a new Avastar character it will initially be displayed with arms pointing horizontally and sideways. And both feet are parallel to each other standing on ground. This is the “T Pose”, apparently because the character forms the shape of the letter “T”. This pose is also the “neutral” pose. That is, the original character mesh is in that pose. The process of “posing” is nothing else than changing the neutral pose of the character by moving the character bones. And for this to work need to map the bones to the mesh in some way. This is where rigging and weighting comes into play. ALT+r to reset the rotations. ALT+g to reset the translations. File -> Open template -> Avastar textured. 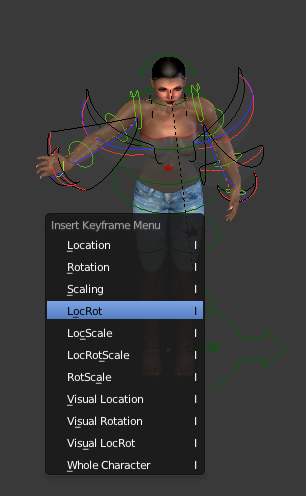 Select the rig (armature) in object mode (actually it is already selected). Switch from Object mode to Pose mode. Now you see “Ava” our female pose model. Avastar displays all bones as light green circles by default. You can select the circles and move them around (keyboard shortcut: “g”) and rotate them (keyboard shortcut:”r”) . However, selecting and moving one bone can potentially affect other connected bones as well. Select the (green) bone controller of the left wrist (using the Right Mouse Button). Move the bone down as shown on the image (using the “g” keyboard shortcut). You see that while you move the bone around, the entire arm follows the hand. Thus you not only have moved one single bone with your action, but you moved all chained arm bones as well. More precisely: All bones up to the collar-bone. 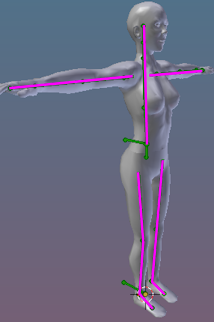 This armature property is “Targetless IK” (Inverse Kinematic), and the set of affected bones is the IK- chain. In our example the chain starts at the wrists and moves up to the Collar bones. Actually Targetless IK is a great and time-saving feature. Imagine you needed to pose each bone separately to get your pose done. But hold on, there is an issue. Take a close look at the left shoulder. 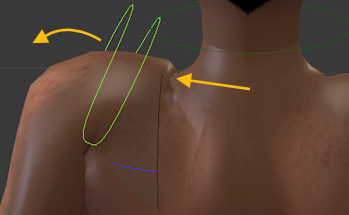 When you inspect that area in detail, then you see an ugly distortion near the neck (see image). The pose has bended the mesh back into itself and it ended up intersecting its own surface. This can easily be fixed by rotating the collar-bone back a bit and all is well. When at least one of the now selected bones is IK enabled, then you find the Targetless IK control panel in the property sidebar of the 3D view. It is in the “Rig Properties” section. We have 5 separate IK chains: two for the arms, two for the legs, and one for the Spine up to the head. Each chain starts at the outermost bones (wrist, foot bone, skull) and by default moves up to the collars, the Hips and the torso. You can change each chain to end at the outermost bone, or all the way up to the COG Bone (that is the Center Of Gravity bone on the Avastar’s backside, just above the Pelvis). the 5 IK chains marked as pink lines. 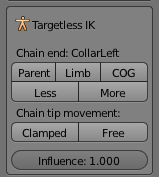 in the Targetless IK panel click “Less” to shorten the chain by one bone. When you now move the wrist, then the Collar is no longer affected. The 3D Manipulator allows to move and rotate bones just by click and drag. In particular i found the Rotate manipulator very handy to quickly adjust bones. In this context the Normal orientation setting makes most sense as it aligns the manipulator always to the selected bone’s orientation and thus the rotation axes are always oriented in a meaningful way regardless of the current Viewport angle and bone angle. 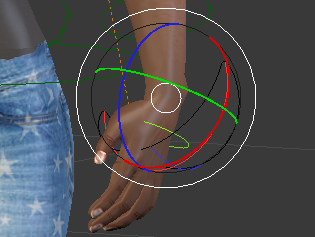 For example you always will rotate the wrist (green circle), wave hands up/down (red circle) and sideways (blue circle) regardless of the parent bones, the object orientation and the viewport angle. You find the 3D manipulator Settings in the footer of the 3D View. 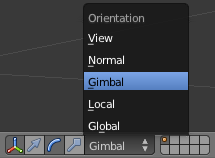 You can find a detailed description of the 3D Manipulator and its orientation modes in the Transform Orientation page in the Blender Wiki. 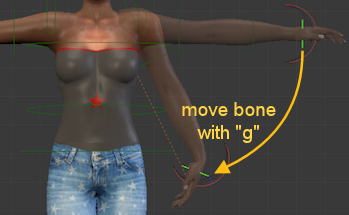 How to move bones with the “r” and “g” shortcuts. How to use the IK Chain controller and. You know a bit about the 3D Manipulator. So please go ahead and tweak the hand pose further by moving and rotating the affected bones to your wishes. Then go on with posing the right hand. And at the end of your work you have created something similar to the image on the right side (or something very different of course when you prefer to create your own pose). But please take care here. Normally you also want to adjust the Torso bone as well to get a bit more life into the character and let it look less static. How you pose your characters is your personal taste and from here on it is up to your artistic eye to decide how to finish this task. It is also very helpful if you have some knowledge about anatomy. We know (or maybe just guess) that an animation is something dynamic, like a set of changing poses displayed over time. And a pose is something static, where the character does not move. While this is in principle correct, technically a pose is exactly the same as an animation. Only that the “set of changing poses” has only one pose which gets replayed in an endless loop. The Timeline: is a recording of animation changes over time. Thus whatever movement happens for whichever bone, you find the information in the timeline. You find the timeline in the lower part of the default Blender screen. There is also a timeline cursor available, a green vertical line, initially set at position 0 (zero) in the timeline. Note that timelines are always attached to Objects. In our case the timeline is attached to the Avastar character. A Keyframe: is a set of bones and their transformation data (location, rotation, scales) at a specific point in time. A keyframe does not need to store all character bones. It is enough when it stores just the changed bones since the last keyframe. Creating a keyframe for a pose is really easy. While the mouse cursor is in side the 3D view, press the “i” key on the keyboard. A Pop up Box appears. Here we can select which transformation type shall be keyframed. Since we only have changed Location and Rotation, we will select “LocRot”. Note: After keyframing a new yellow vertical line has appeared in the timeline at the current time position (0 in our case). Pitfall Alarm: Please never insert a keyframe for the Whole Character (the last option in the keyframe menu). This would generate animation curves for all bones. Further reading: Why no head pose ? You may have noticed that i did not pose the head. I did this on purpose! The reason is that the SL animation system allows us to play and mix multiple animation sequences and poses at the same time. As a rule of thumb each bone that is NOT contained in a specific pose will be free for getting animated by other poses. For example the head movement is normally controlled by the mouse. But this works only if the head has not been explicitly posed in our character. 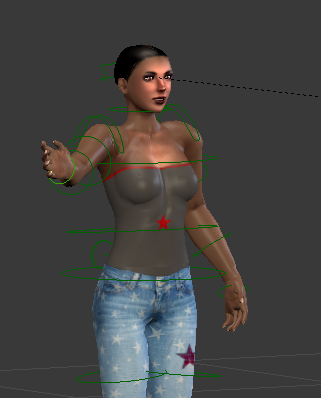 We will see in a moment how our pose keeps intact while we can move the head and even walk around in SL. Start Frame = 1 ( we only have one frame ). End Frame = 1 ( could be 2 as well ). 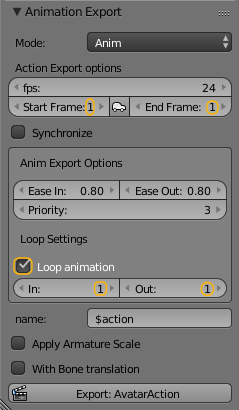 Loop Animation = enabled (to keep pose running infinitely). In = 1 (Ease in and Ease out. Could be made longer, typically 0.8 secs). When you click on the “Export Animation” button, you end up in a file selection window. There you can can specify the export file name and location on your disk. Hint: You can animate the eye movement with Avastar. However the eye animation is only supported with the .anim format.